It is an extremely moving turn of phrase, especially when one comes across it after a visit to the battlefields of Gallipoli. It also captures the rather strange place which Gallipoli and the World War I campaign associated with it has in the Turkish imagination and in Turkish historiography. The Gallipoli campaign was one of the most tragic and bitterly fought battles of the First World War. The Dardanelles – endlessly coveted by rulers and empires – were once again the centre of attention once war had broken out in Europe. In a plan championed by Winston Churchill (then Britain’s first lord of the admiralty) the allied forces would attempt to take control of the strait so as to secure a sea route to Russia and take control of the Ottoman capital, Constantinople. The allies had little faith in the Ottomans’ military ability, but the Turks were prepared with reinforcements, and what was supposed to have been a quick campaign lasted nine months. By the time the Allies withdrew in defeat in early January1916, the two sides had suffered roughly five hundred thousand casualties between them in what is today seen as a wasteful and bitterly sad campaign. Gallipoli was a massive military victory for the Turks. Compared to the other Turkish campaigns of WWI such as those of Mesopotamia (which started off as a success and ended a failure), Arabia (disaster again) and Sarıkamış (absolute catastrophe), the success at Gallipoli seems almost miraculous. That Gallipoli is still part of Turkey obviously plays a role in why it is still viewed with so much importance. Had this victory been won over a piece of land that is now somewhere in Iraq, it would hardly have been the cause of such chest-beating amongst the Turks no matter how epic the victory. But there is also another factor; the figure of Mustafa Kemal. Then-Lieutenant Colonel Kemal led the successful counter-attack against the invading ANZAC troops on the morning of 25 April 1915, famously ordering the 57th Infantry Regiment not to fight, but to die. Every soldier of the regiment was either killed in action or wounded, but the Turks won the battle and Kemal’s reputation was cemented. Once Kemal had successfully led the independence struggle, established the Turkish Republic, and been honoured with the surname Atatürk – Father of the Turks – it was perhaps natural that the battle of Çanakkale would become as central to the narrative of the nation as it was to that of its great leader. And so Gallipoli came to be the first step on the path to Turkish independence, the single most important event that led to the awakening of Turkish nationalism. Never mind that this was a war fought by the Ottoman army for the preservation of the very Empire that the nationalist forces went on to destroy as a result of the Turkish War of Independence. Çanakkale has been high on the agenda of Turkish popular cinema recently, with two big-budget films related to the campaign released over the last couple of months. Çanakkale Cocukları (The Children of Çanakkale) and Çanakkale 1915 were released within a few weeks of each other and seemed to signal the hype and hoopla that will inevitably surround the run-up to the 100th anniversary of the battle. The aforementioned hype and hoopla may just be starting. There are reportedly another three films on the topic in the works, each with (by the standards of Turkish cinema) large budgets. One, Çanakkale Içinde (In Çanakkale), will reportedly have Mel Gibson playing a British commander. Another, Çanakkale Gecilmez (Çanakkale will not be Crossed), will be helmed by Faruk Aksoy, the director of Fetih 1453 . This handful of films are also symbolic of a larger trend; Turkish popular culture’s love for epic historical drama. The TV serial Muhteşem Yüzyil (The Magnificent Century), which depicts the reign of Sultan Suleyman the Magnificent, and the blockbuster film Fetih 1453 (1453 – The Conquest) about (what else?) the conquest of Istanbul seem to have set the stage for other important nationalist events and eras to be dramatized. Clearly, the Çanakkale campaign is high on the list of events that offer scriptwriters potent raw material. I was curious as to see both Çanakkale Cocukları and Çanakkale 1915 to see what these films on Çanakkale might have to say on the topic. Popular history in Turkey often falls into the comfortable realm of nationalism, and cinematic historiography is no different. This is, after all, a country where a film depicting Mustafa Kemal drinking, womanising and afraid of the dark was slapped with the charge of offending Atatürk’s memory. In a way, I thought, it was a bit of a bonus to have two films on the same topic releasing at the same time. They might just make for an interesting case of compare and contrast. Çanakkale 1915 starts with the period of the Balkan wars and anchors the potential impact of the First World War within this context. The Ottoman Empire was crumbling and if the Turks lost the battle of Çanakkale, it would have only sped up the process. The victory halts this slow decline and (though the film never directly mentions it) its ending shot showing Mustafa Kemal leading the army against the invading forces, hints heavily that the victory set the course for the War of Independence that Kemal was to lead. It is interesting to note that the film ends on at this moment rather than at the time of the final Allied evacuation, when Kemal was no longer in Çanakkale. In some ways the movie is historic to a fault. It often feels like a cinematic collation of events of how a child would be taught the history of the campaign in a school textbook. Most of the characters (and there are many of them) have no humanising backstory. The only one who stands out, with his piercing blue eyes, is Mustafa Kemal. It is telling of how the history of the campaign has been hijacked by the history of Atatürk. His is the central story. There were other officers (more senior and important ones) who played crucial roles in the defence of the strait, but they are now minor figures in how their role is remembered by history. Kemal’s words and actions at the time are now so famous that they do not need a backstory. But Çanakkale 1915’s huge shortcoming is how it does not telling us very much about the other people who fought in Çanakkale because it is too preoccupied with ticking off a checklist of battlefield events. The movie does add one new dimension in the historiography of the war when it depicts soldiers from the Arab lands in positive light. Here, they are not backstabbers, but brothers who speak a different language. It is perhaps apt that a film that sticks strictly to the narratives of popular historiography has also added the very latest trend of neo-Ottoman nostalgia to the mix. If Çanakkale 1915 was too narrowly preoccupied with the history of the campaign, the other Çanakkale release, Çanakkale Cocukları, turned out (to my surprise) to be absolutely ahistorical. Directed by the famous advertising director Sinan Çetin, the film tells the story of a high-ranking Ottoman official Kasım Bey, his Australian wife Catherine, their two sons, James and Osman, and how their lives are affected by the war. The two sons end up in the trenches of Gallipoli on opposing sides. James, who always considered himself Australian, fights with the Australian and New Zealand Army Corps (ANZAC) troops, Osman with the Ottomans. When Catherine has a premonition that her sons will kill themselves on the battlefield, she forces her husband to accompany her in scouring the trenches to find her sons and stop them from fighting each other. In the run-up to the release of the film Çetin stressed that the film was anti-war and anti-nationalist, which is quite different from other films on the topic. Çetin often repeated a line from the film that if only mothers ran to the battlefields and stopped their sons from fighting, there would be no wars in the world. In addition to this nonviolent propaganda, the film also claims to talk about the experience of Kurds in Turkey. I was surprised by this, but in a showdown with his father James says that he fighting with the ANZACs because he was forbidden to speak English at home and that his house had become his prison. Which I guess suffices. In truth, the film is so nonsensical and bizarre (a testimonial on the film’s website calling it “a surreal look at the war” does not even scratch the surface) that any lofty moral points it wants to make are lost in the mess. The story is so focused on the family histrionics that the film ends up telling us absolutely nothing about the broader war or indeed anything believable about the frontlines or the experiences of ordinary soldiers who fought there. This could be a film about any war; indeed, if a point had to be made about the Kurds a more topical film could have been made to do so. My efforts to contact the makers of the film to ask why they had decided to set the story in Çanakkale were in vain, but the answer is probably quite simple. History is selling in Turkey, and a film on Çanakkale would probably get more people into the theatre than one on just about any other war. I came away from having watched the two films thinking that they had absolutely nothing in common except the word “Çanakkale” in their titles, but there was something else I suppose. Both films in no way challenged – or even deepened – the common perception or understanding of the Çanakkale campaign. In that they seem to follow in the footsteps of other Turkish historical films which often toe the line of acceptable history and overarching storylines. 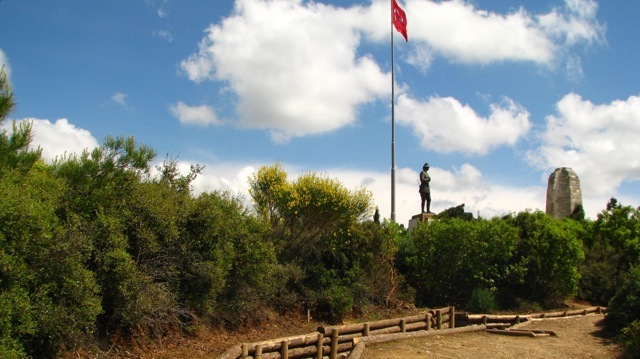 The battle of Çanakkale was indeed a moving and epic struggle, and there are many, many stories about it that could be told. The story of the last survivor who had fought in Çanakkale, during the War of Independence and lived through the birth of the Republic, for example. Or the story of a young man who won the Istanbul league as a player for the Fenerbahçe football club but died fighting in Çanakkale the very next year. Or in fact the stories of the Greeks and Armenians who fought in Çanakkale as Ottoman soldiers. There are stories like these that are waiting to be told. Sadly it seems unlikely that any of the upcoming three Çanakkale films, just like the two recently released ones, will tell us anything compelling about the campaign that paved the way for the Turkey we know today except that its myths are as victorious as the army they lionize. Vedica Kant is a writer living in Istanbul. Her personal blog is Seyahatname. A printable (.pdf) version of this article can be found here.